Home > Blog Post > Community Stage! Tonight is all about you and your words! Our community stage is an opportunity for all spoken word artists to perform for an audience. If you’re an old hand at this we look forward to your words! 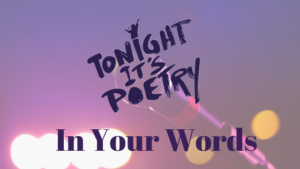 If you’ve never performed your poem before we look forward to hearing your words, too! Show up to just listen to some great spoken word, as well. Bring a friend! Tell your family!